I had the great opportunity to become a tester for a new business called Snappy Greens. It’s run by WAHM Rebecca Rushton. She’s just getting started, and I had the good fortune to stumble upon her early. Right now she has waist extenders (for those covers where the wings aren’t quite long enough), wipes, bibs, burp cloths, and unpaper towels. She has some lovely and adorable fabric. Check out her store here. If you follow her on Facebook, she sometimes has some deals that don’t last long. Click here to go to her Facebook page. Now, on to the review! The snaps match my cover pretty well. These extenders are wiggle proof. They stay put. The workmanship on these is of high quality. 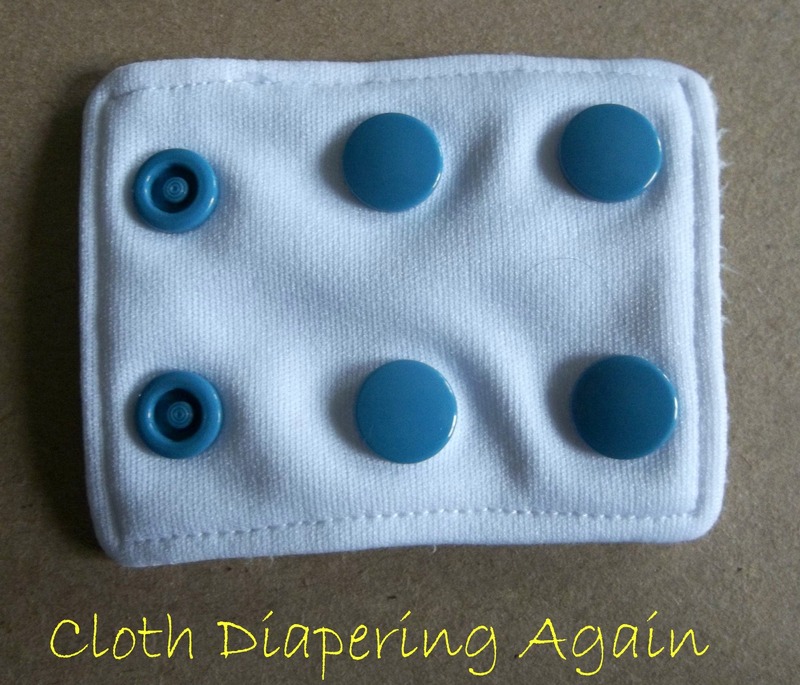 All of the testers she made were of white PUL with the tester’s choice of color on the snaps. I ordered mine for my Oh Katy pocket diaper. My girl was on the last couple of snaps. With the waist extenders, the snaps now meet in the middle! Yay! The snaps are high quality and stay put, even through washing. I like the look of the diaper with the white extenders. The PUL on the front of the extenders is backed by a soft fleece-like material. Now my girl will be able to wear this diaper until she potty trains. Here’s the extender by itself. You can see the high quality workmanship. Here it is attached to my Oh Katy. The snaps are a little lighter. It’s hard to get a perfect match when you don’t have the snaps or diaper right in front of you, but we got a really good one. This is what the extender looks like on the back. The material is very soft. Rebecca provides excellent customer service. 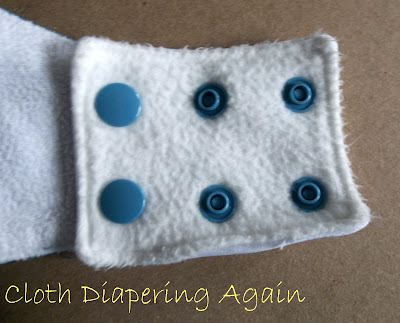 One of the extenders I received from her would not snap on my diaper for some reason, and when I messaged her about it, she apologized and suggested several ways I could try and fix it. Unfortunately, none of the remedies worked, and she offered to send me another one to replace it right away. Awesome! She was really polite and eager to fix it. It’s been a pleasure to do business with her. I really like the waist extenders. They’re good quality and really useful! Rebecca’s customer service is excellent and she’s got some really cute products for sale. 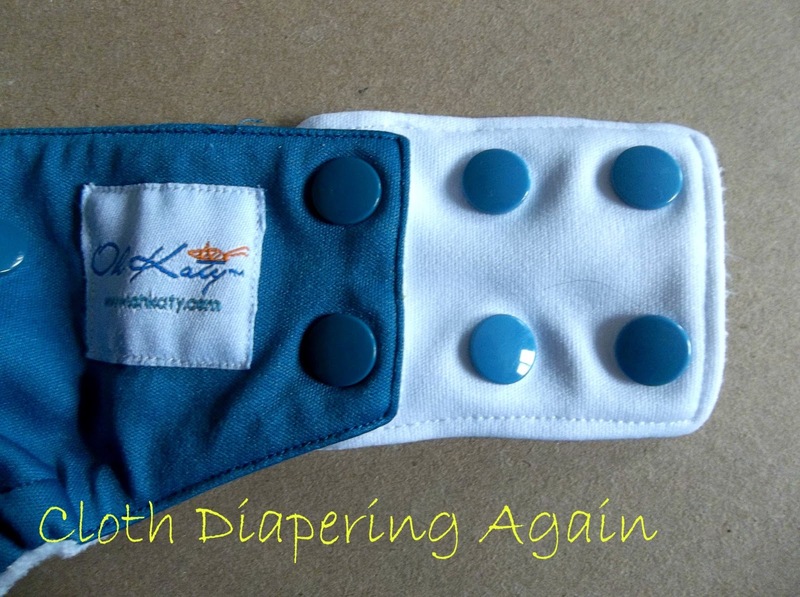 If you have some diapers that don’t fit your baby or toddler around the waist any more, check out Snappy Greens. You’ll get a good quality product and excellent customer service. Disclaimer: I paid for my extenders at a very discounted price for testing. I did not receive compensation for this review. All opinions are my own and yours may differ from mine. These are fantastic! I just had a mom on a local group complain about her 15 month old being on the last row of snaps. I’ll have to show her this link. Please do! Rebecca is really talented and they work great! Hi Suzi! Yes, have your friend send me an email at rebecca@snappygreens.co. I’d love to help! Fantastic! My favorite brand, Best Bottoms, makes an extender tab. However, I was worried about some of my other diapers not fitting if my daughter got too big. This would be a perfect solution. Yes, I have seen Best Bottoms makes one, as does Applecheeks. But I wanted a pair for every diaper. So why not, right? My daughter was teeny tiny and was able to wear most of her diapers without a problem but this would have come in handy for a few brands, since the smaller size had a lower rise they probably could have fit her much longer had I been able to extend the tabs just a bit more. Rebeccca can make them for just about any diaper, so definitely share! I don’t see why not. It’s the same snap configuration.